Let us help you choose the best activity table for your baby! Here are the best baby activity tables! What kind of activity tables are there? Why purchase an activity table? Check Out The Top 10 Baby Activity Tables! Use this comparison chart to help you choose the best activity table for your baby! Activity tables are a great way to engage your baby in a fun learning experience from an early age. An activity table will usually feature a wide variety of toys that promote motor skills, comprehension, communication, thinking abilities, and general knowledge. Lights, sounds, and interactive toys make baby’s early learning stages loads of fun! 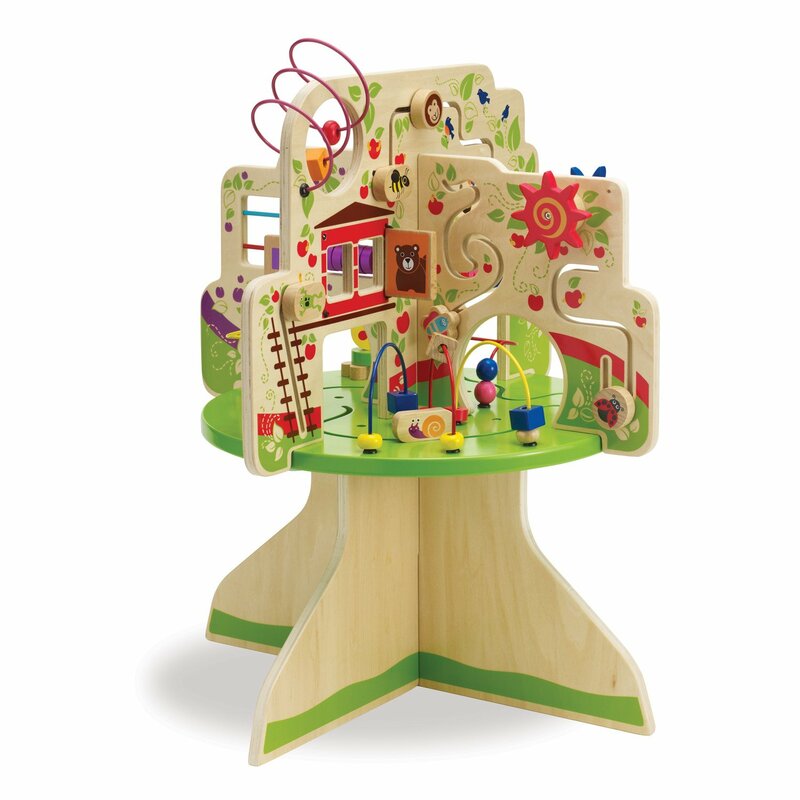 Most activity tables are battery operated with lights and interactive toys and sounds, but some tables have a more classic feel and are constructed of wood, with toys that spin, flip, or move along the table on wire tracks or curved paths. These tables are not electronic and don’t sing or talk to baby, but capture baby’s curiosity and focus with visually stimulating activities that engage fine motor skills and promote problem-solving abilities. Some tables have detachable legs and convert to a floor-play mode for those little ones who can sit unassisted but cannot yet stand steadily without falling over. Other tables have a built-in-walker; a chair attached to or in the center of the table which allows baby to sit supported and practice balance and walking, while still having access to the various areas of the table. This chair can usually be removed once your little one can stand and begins to walk on their own. Activity tables can be a benefit for both baby and parents. For baby, physical development, stability as they begin to walk (something to hold on to and walk around), intellectual stimulation, and endless fun and entertainment to their every day lives at home. For parents, this is a handy tool to keep baby’s attention when you need a break for whatever reason – to complete a few household chores, tend to other children, or even just to have a moment to sit down and read a book or watch your favorite show. An activity table is a good way to keep baby’s attention while they learn and play so that you can have a few moments to yourself to tend to personal tasks. Choosing an activity table for your baby is simply a matter of deciding what features you want for your baby’s early learning stages. Most tables cover a general variety of learning areas: shapes, colors, letters, numbers; motor skills, problem-solving, thinking and comprehension, and general knowledge. But there may be other things that you are looking for for your baby. Bilingual options, 3-in-1 options so that the table grows with baby’s stages (sitting, standing, walking), and multiple learning levels for age and development stages may be things that you are looking for in your baby’s activity table. There are a few other things to consider when choosing an activity table for your baby. Size, material, and age recommendations are all important factors, especially when considering baby’s safety. It would not be wise to allow a 9-month-old baby to play with a table that is recommended by the manufacturer for ages 12 months and up. There are various types of tables to fit a range of needs, including available space and price range. We’ve put together this list of the best baby activity tables for you to choose what best fits your needs with ease. Take a look! This beautiful table is constructed of solid wood and painted to detailed perfection. With a simple, classic feel and unique design, this table makes the perfect addition to any living space and provides baby with a vibrant array of activities and engaging figures. The four quadrants of the table feature animal and insect friends which glide along curved paths and hide behind peek-a-boo doors. 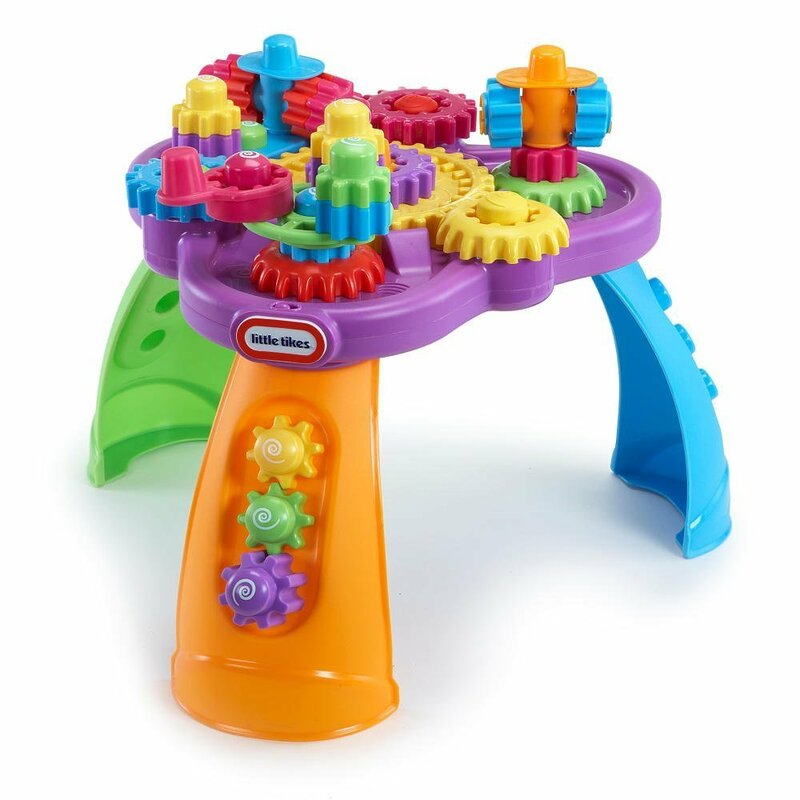 Multicolored beads run along painted wire tracks, and colorful shapes, dials, and gears keep baby’s focus and engage problem-solving abilities and motor skills. This table offers a lovely, natural look and a myriad of themes and activities, making it a perfect and lovely choice for your baby. This table doubles as a walker with a seat that moves 360 degrees around the table, promoting development as baby learns to stand and walk unsupported. The base of the table is weighted to ensure balance and no tipping over. When ready, the seat can be removed for baby to maneuver the table independently. 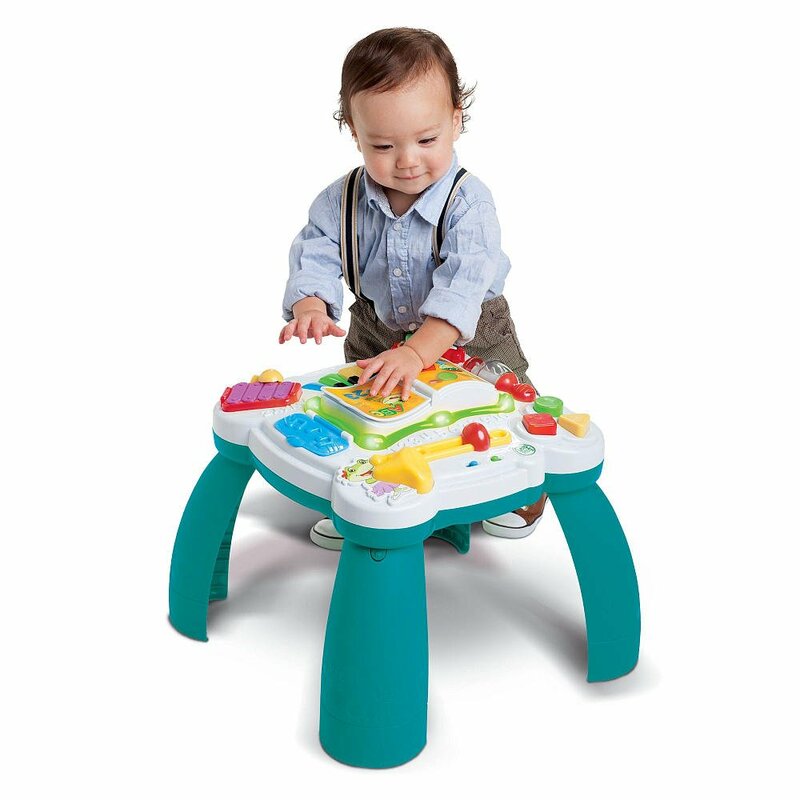 This table features animal friends that slide, rattle, push, wobble and spin, piano keys play realistic piano sounds and melodies, and a colorful flip book with various characters and sounds, providing baby with more than 15 fun activities. A special compartment with a drink holder and snack tray allow parents to provide baby with a snack within reach as they play. Develop baby’s fine and gross motor skills simultaneously with this vibrant and versatile activity table that grows with baby through the toddler years! This unique table features more than 20 multi-colored gears that can be re-positioned, moved, and stacked on the table or on the floor. The gears interlock, twirl, and activate fun, music, and gear sounds. Gears can be placed on pegs on the side of the table’s legs for even more playtime versatility. This table enhances cognitive learning, motor skills, and comprehension of cause and effect. The table’s legs are removable to convert to a floor-play mode and keep baby moving and entertained. The table is completely customizable for endless ways to mix, match, build and play. This silly table is sure to provide fun and laughs for your baby! The colorful “Ballcano” balls erupt from the center of the table and spill down the legs in zig-zags, drop-and-roll, and curving patterns. Lights, rollers, and silly characters keep baby moving and laughing! This table exercises 3 stages of gross-motor skill development: crawling, standing, and walking. 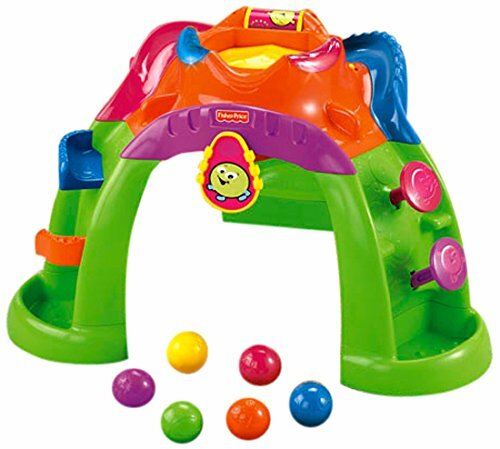 Fine motor skills, cause and effect learning, and hand-eye coordination are engaged by encouraging baby to place the balls back into the center of the table, giving baby full control of the movement and speed of play with this table. This fun table is a great way to develop baby’s motor skills and cognitive development while keeping baby entertained and on the move! The VStar Magic Learning Table is loaded with buttons, lights, and music to give your baby a variety of fun learning toys and modes of play. The legs are detachable to allow floor-play for babies who cannot yet stand unassisted. This table also has a bilingual option. This table features a steering wheel that drives the bear ’round the center of the table. Press the star in the middle to hear music and sounds. The flip-page book plays nursery rhymes to learn and sing along to. The piano keys introduce your baby to rhythm and color recognition. The play phone calls your baby’s animal friends to encourage pretend play, number recognition, and social skills. Turn the gears to practice fine motor skills. 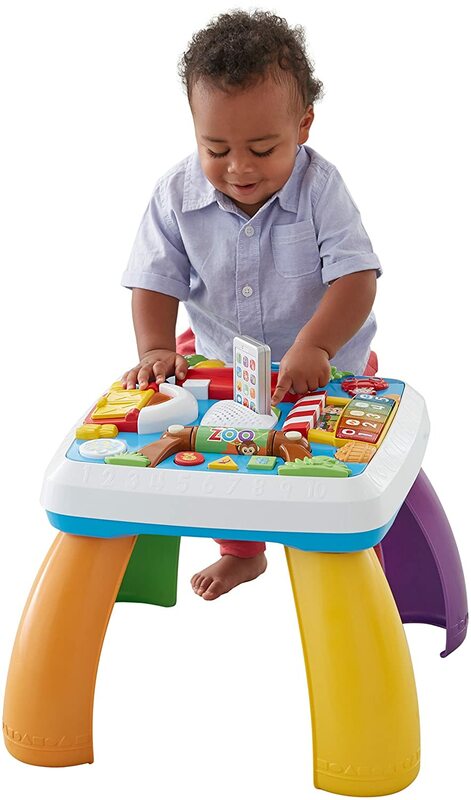 With multiple play areas and early learning techniques, this table is an affordable option without compromising quality and fun for your baby! This wooden table is big enough for up to 3 children and offers a whimsical, colorful design with six activities. Painted to perfection, this beautiful table keeps baby’s hands and mind moving and practices motor skills and thinking abilities. Your little one can chime a tune on the xylophone with the included wooden mallet, thump the drum, slide the beads and wooden cars, spin the gears, and play with funny friends behind the peek-a-boo doors. A lovely addition to any room with a classic look, this durable table provides hours of entertainment and learning fun, and can be used for many years, or even passed down through the family generations! 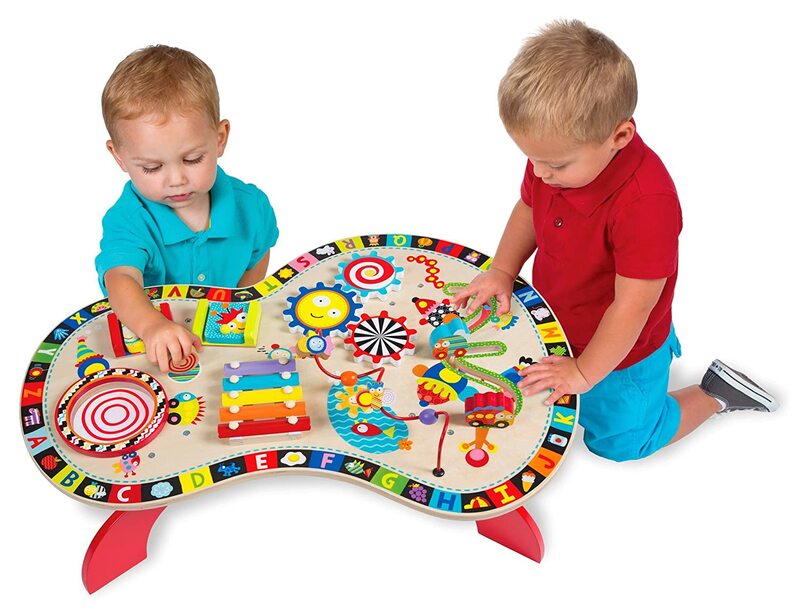 This table features two play modes: Music and Learning. Your baby controls which mode to play in by flipping the page of the interactive book in the middle of the table. This table also has a bilingual option. 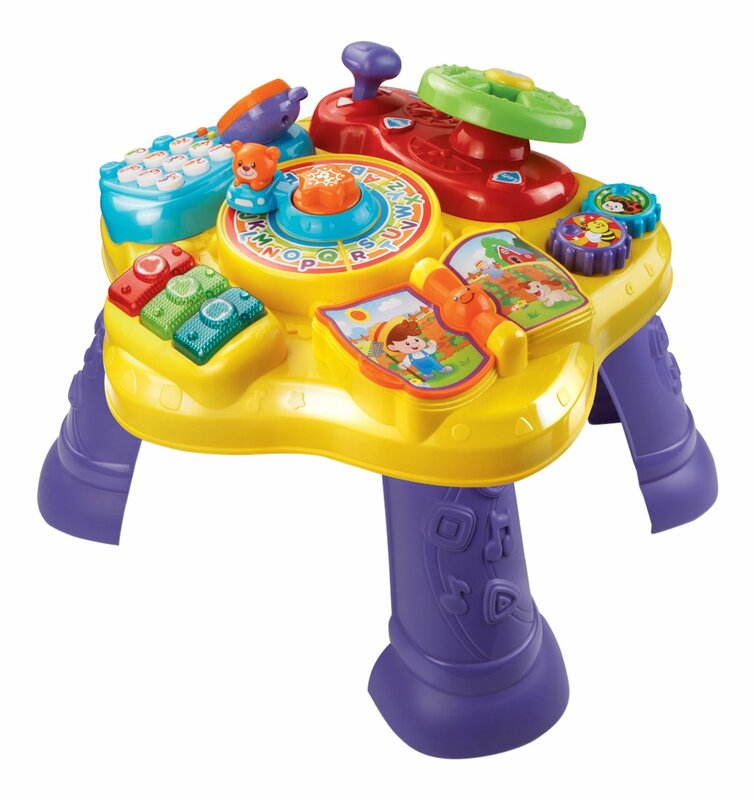 With over 70 tunes and responses, this table provides lasting entertainment and educational fun for your baby! Baby can press, slide, pull, and spin the instruments found along the table for cause and effect learning. The operation of these toys enhances motor skills, and the sounds and responses teach shapes, colors, letters, numbers, opposites, and real instrument sounds while enhancing early vocabulary and comprehension. This toy is highly educational, fun, and entertaining for baby, and very affordable! The laugh and learn around the town learning table offers real-life roleplay activities and stations for baby to “visit”, including a zoo, farm, market and puppy friend’s home. Baby will learn and grow with three levels of age-appropriate educational play: 1 – Explore, 2 – Encourage and 3 – Pretend. At the zoo, your baby will learn about animals and shapes with fun tunes and melodies. The market features piano keys that teach your little one about numbers, foods, and colors. The farm showcases a cute barn with peek-a-boo doors; each time baby opens, a different animal friend waits inside! Finally, puppy friend’s home where our puppy friend will teach baby about the alphabet, and opposites. The interactive phone in the center of the table will guide your baby around the table, by lighting up a new area for baby to visit when they press the button! The phone will also “call” our puppy friend for role-play fun! With bilingual options and endless play options and more than 120 songs, phrases, and sounds, this table is sure to keep your baby’s attention while enhancing early learning and comprehension. This fantastic 3-in-1 activity center grows with baby. The table folds down for floor play for crawlers, then extends into a walker to support baby’s first steps. Once baby begins to walk unsupported, the play panel slides up and locks into place, and the wheels can also be locked in to place to convert the walker into an activity table! 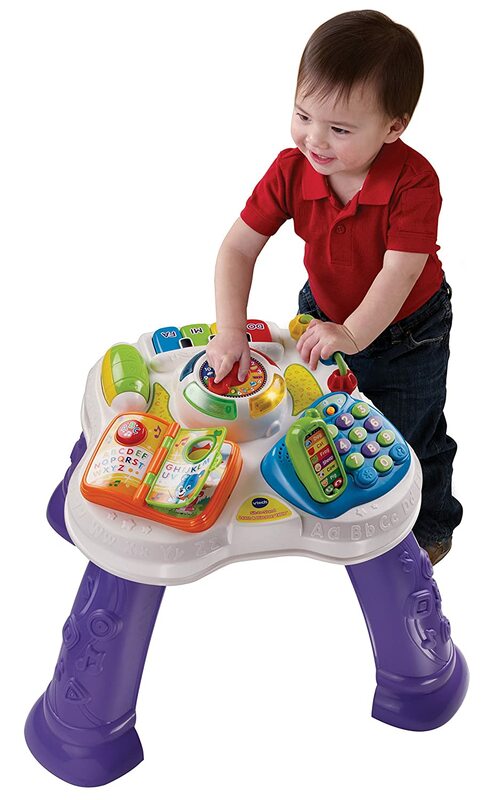 The activity panel features 3 modes of play: Words – teaches baby shapes and colors, Music – teaches baby rhythm and music, and Wild – featuring jungle animal sounds and fun tunes. 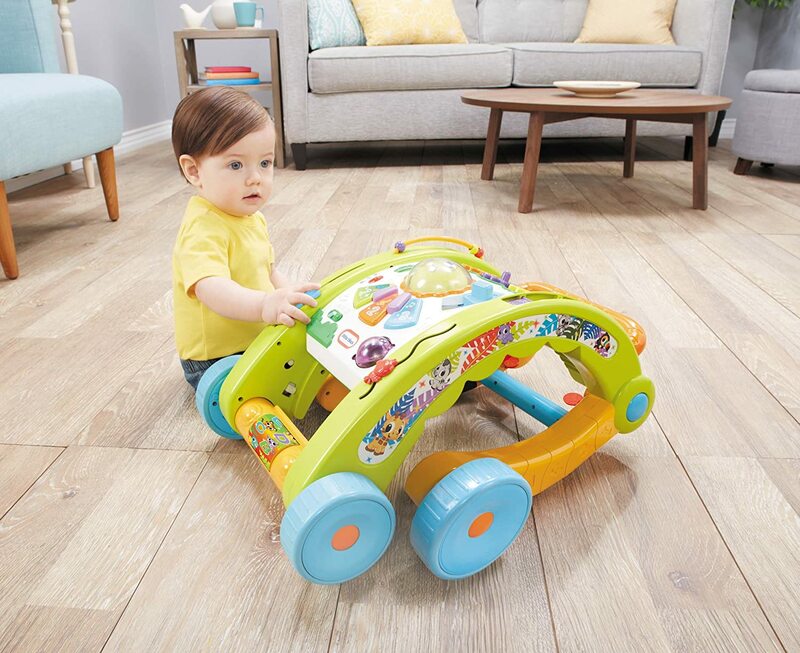 With flipping books, a spinning drum with the alphabet, a glowing light dome in the center of the panel, spinning gears and more, your baby will learn and play while on the move all day! The versatility of this product supports baby’s gross motor development from as early as 9 months, and cognitive thinking with over 70 activities, songs, and sounds. With 3 ways to play, this activity center will keep baby playing, moving, and learning, guaranteed! 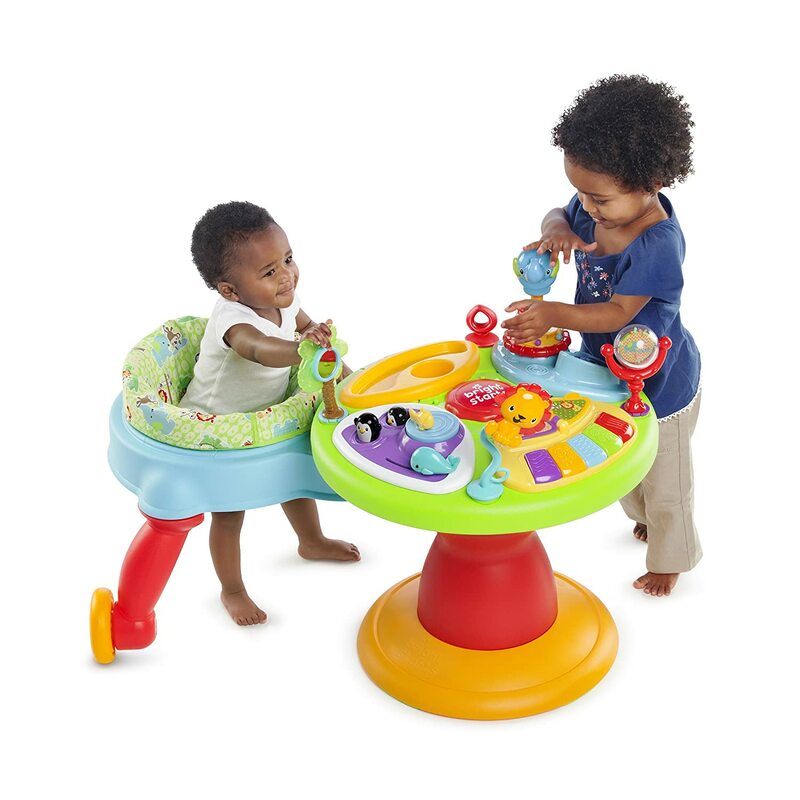 This sit-to-stand activity table has removable legs for floor play mode. The interactive sounds and play modes have an automatic shut-off feature to save battery life – it automatically turns off after 60 seconds of inactivity. Two volume settings give you more control over baby’s playtime noise level. Six playing areas teach baby number, letter, and color recognition. The piano provides music education with realistic keyboard sounds, and the clock introduces baby to time telling. The interactive telephone encourages social skills and roleplay. Flip the pages of the book to introduce your baby to words and shapes. As always, safety is first when it comes to using these types of toys for your baby. As your baby begins to pull up, stand, and walk on their own, they may try to pull up on the activity table, which can be dangerous if the table is not sturdy enough and poses a risk of tipping over. Additionally, as baby begins to teeter and totter while they take those first steps, their weight might be appied to the table in a forward motion. If the legs do not grip, the table may slide forward and cause baby to fall forward and be injured. Be sure to follow manufacturer’s age, weight, and height recommendation for use. Apply rubber grips to the bottom of the table’s legs to prevent slipping. Unless the packaging states that the table is suitable for baby to pull up on, do not attatch the legs until your baby can stand without holding on. Keep the activity table on a flat, level surface, and always make sure that the legs are even and securely in place. Always ensure adult supervision while baby plays with the table. No need to hover, just be present in the same room.